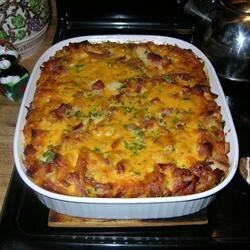 "This ham and cheese casserole is very filling. It should be assembled and then refrigerated overnight. I usually make this Christmas Eve and serve it Christmas morning after we open our presents." Lightly grease a 9x13 inch baking dish. Line the bottom of the dish with half the bread cubes. Sprinkle with ham, Cheddar cheese, and Swiss cheese, and top with remaining bread. In a bowl, beat together the eggs, milk, and onion powder. Pour evenly over bread. Cover, and refrigerate overnight. Bake 40 minutes in the preheated oven, or until bubbly and golden brown. Let stand 5 minutes before serving. I used this for a New Year's Day Brunch and it went pretty quickly. I liked that I could prepare it the night before and then pop it in the oven that morning. I will use this again! It was great! Everyone loved it. I now serve it every Christmas morning. I made this for a brunch I was catering and heard good comments about it. I added some fresh sliced mushrooms, too. I doubled the recipe and added spinach - very good! A great hit with my co-workers and wonderfully easy to prepare the night before for breakfast, brunch or lunch! !